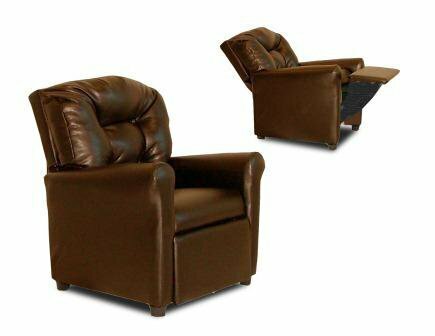 The Dozydotes 4-Button Kid Recliner - Pecan Brown is sure to be a great addition to any kid's room. It's crafted with a durable solid hardwood frame and upholstered in soft pecan brown fabric. The easy-recline mechanism makes relaxing even simpler. Dozydotes' mission is to bring joy to children and confidence to shoppers, which Dozydotes achieves by offering designs and high quality products. The brainchild of experienced mother Rene Campbell and elementary educator Alisa Clark-Slodoba, Dozydotes aims to bring smiles to the faces of children and parents alike with fun, creative products. Designed with kids in mind, Dozydotes recliner chairs are miniature versions of the real thing and are equally attractive, meaning your child will have a custom-sized chair that will look great in your home. Upholstered in durable pecan brown leather-like fabric. Made of high-quality solid hardwood. Cushioned foam and springs. Ideal for kids 2 to 9 years. Supports weight up to 100 lbs.. Dimensions: 23W x 25D x 28H in.. Supports weight up to 100 lbs.